IEA's examination structure is flexible and allows students to complete the programme in a timescale most suitable to their own circumstances. There is no time limit in which to complete IEA qualifications. On successful completion of one of the IEA programme, a second qualification can be achieved by completing a few additional subjects. For example, a student who attains the IEA Professional Graduate Diploma in Entrepreneurship for the core module can acquire three more specialization modules to complete the IEA Professional Graduate Diploma for Supply Chain Management. Students can study for an IEA programme at IEA accredited college or by self-study using IEA Study Manuals, recommended textbooks, subject syllabuses and Past Questions and Answers. If students move to another country, or another town in their own country, usually there will be an IEA accredited college nearby providing tuition facilities. IEA courses are not only conducted in English language, but it has regional options for supplemental language support. This means that different countries can wisely choose the suitable language to conduct the courses locally. Teaching materials, local examiners, lecturer and references book for the courses obtained locally but must be first being moderate by IEA, UK to maintain the standards of the quality. Student fees are highly competitive as IEA considers that it has a duty (especially to students in developing countries) to offer business and management education at an economical price due to IEA is a non-profit making organisation. It is recognised by most of the Multinational Companies, as it is a professional and practical course. It is accepted to enter for admission to Affiliate Universities, colleges, and institution around the world. 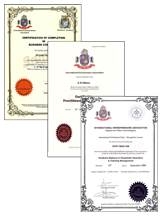 IEA members are recognised as Certified International Entrepreneur (CIE) internationally because students go through professional training as real world entrepreneurship skills. IEA will not only train students in academic or theoretical study but also in professionalism and practical environment to create a truly successful professional and entrepreneur in the society. IEA members will have the opportunities to build up wide networks in different countries.